Grab the Philippine Arilines promo deals for select domestic and international destinations on July 8- 9, 2017. 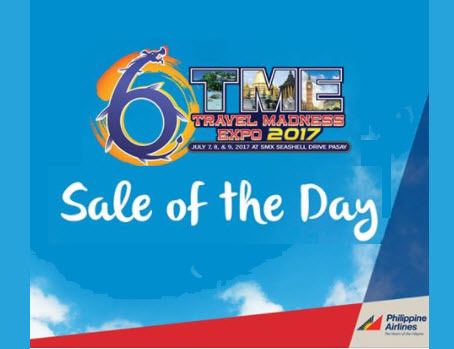 PAL is one of the sponsors and participants in the ongoing 6th TME Travel Madness Expo 2017 which is held at SMX Convention Center in Seashells Drive, SM Mall of Asia Complex, Pasay City. All Philippine Airlines promo fares are ALL-IN: fare, taxes fees and charges are covered by the ticket. Free hand carry bag and checked baggage allowance are included as well. Philippine Airlines has feature Sale of the Day promo. Visit Philippine Airlines booth at Hall 1 to avail the sale tickets. Travel Period- January 16- March 15, 2018. Trips must be completed by April 30, 2018. Quoted ticket prices are limited and subject to seat availability. Promo tickets are on First Come, First Serve Basis. Mabuhay miles accrual applies to the sale tickets. Fares are non-refundable and non-rebookable using the same fare. So, if you are looking cheap fares for your trips, visit Philippine Airline booth at Hall 1 SMX Convention Center on July 8-9, 2017. General admission fee for the travel expo is P50.00 and P40.00 for Senior Citizens and PWD. For airline promo fares, seat sale 2017 to 2018, Like and Follow us in Facebook: PISO FARE TICKET!